golf memberships, superb amenities, outstanding service, open to the public, and 18 holes of magnificent golf. The perfect Arizona Golf course, Torres Blancas Golf Club, is nestled in the Santa Cruz River Valley at the foot of the beautiful Santa Rita Mountains. 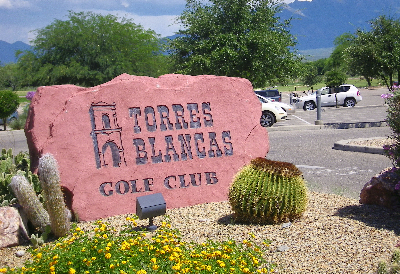 An Arizona golf vacation at Torres Blancas offers a championship course designed by Lee Trevino, Ocampo and Fernandez. Torres Blancas meanders through charming neighborhoods and breathtaking desert scenery. The par 72 course comes with 3 lakes, numerous sand traps and generous, undulating greens. Five sets of tees offer a challenge to golfers of all abilities with a maximum yardage of 7,111 from the tournament tees to 5,010 yards from the forward tees. Visit the Pro Shop for a wide selection of attire and supplies. We take pride in presenting a full service golf shop with famous name brands such as Footjoy, Titliest, Adidas, and Ouray Headwear. Torres Blancas is a golfer friendly facility, and most importantly is a lot of fun to play walking or riding.